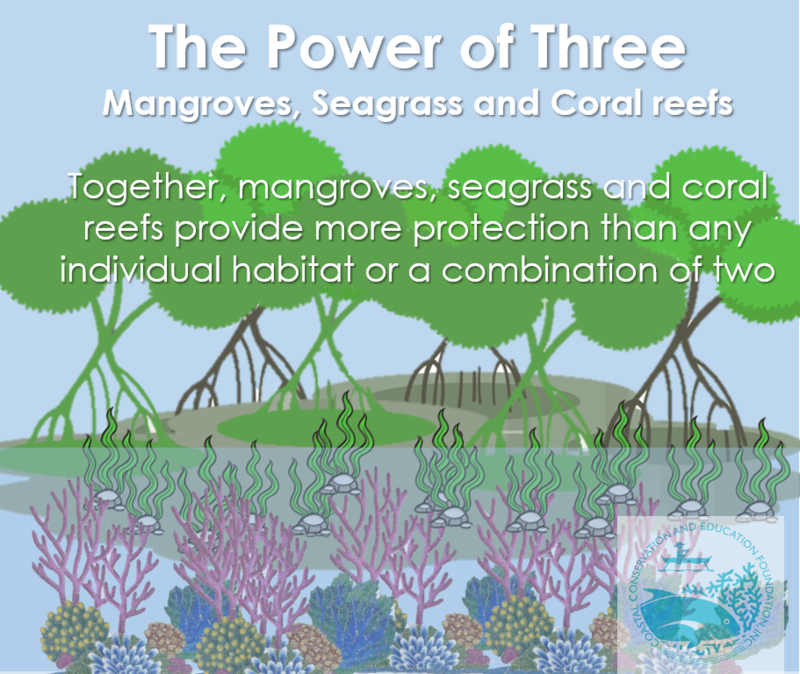 The Power of three: Mangroves, seagrass and coral reefs. This article highlights the synergistic protection services provided by the three habitats. This was posted in Facebook and has reached the highest engagement. Although Mangroves, seagrass and coral reefs are all productive and important ecosystems, they also represent the most threatened ecosystems globally. 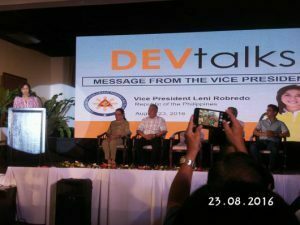 In the Philippines, these ecosystems are often conserved as individual habitats, but we must take note that together these three provide more services than an individual or any two of them combined. In addition, these three are not isolated systems, and they actually help and protect each other from disturbance such as pollution and climate change. Many coral reef fish use different habitats, and in some they use different habitats in each life stage (Jaxion-Harm et. Al, 2012). Most fish stayed in coral reefs in their adult stage, while juvenilles stayed in seagrass and mangroves. To take for example, According to Honda et. Al (2013) more than 20% of commercial fish species used multiple habitats, highlighting the importance of including different habitat types within marine protected areas and conserving fisheries . 90% of fish in mangrove areas used multiple habitats, further demonstrating the key role of transplanted mangroves as a reef fish habitat in the Philippines. This highlights he importance of maintaining habitat connectivity among these three ecosystems. According to Green et. Al (2013. ), connectivity is the demographic linking of local populations through dispersal of pelagic larvae and movement of juveniles or adults. Moreover, it is also noted in several studies that mangroves and seagrass are key protectors of coral reefs from bleaching and ocean acidification (Yates et. Al 2014). Coral reefs are highly threatened by increasing temperatures and due to climate change and may even cause mass bleaching events (Apistar et., 2012). Mangroves and seagrass absorb large amounts of CO2 (which is a a greenhouse gas that contributes to global warming), as well as filters nutrients and litter, and reduces the pH of the water. Mangroves shaded areas to have 0% bleaching of corals compared to mangrove unshaded areas, as well as their roots becoming substrates for coral recruitment in dry and humid seasons. CCEF acknowledges the synergistic effect of the services provided by these ecosystems and is dedicated to protecting these coastal resources through science based coastal resource management, and IEC. Apistar, D., N. Setiasih, 2012. 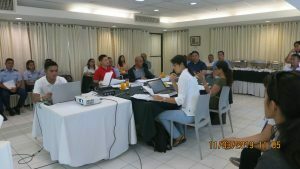 How to Assess Coral Bleaching in Your Community, Coastal Conservation and Education Foundation, Inc., Cebu City,Philippines. Green, A., White, A., Kilarski, S. (Eds.) 2013. Designing marine protected area networks to achieve fisheries, biodiversity, and climate change objectives in tropical ecosystems: A practitioner guide. 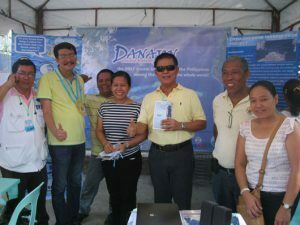 The Nature Conservancy, and the USAID Coral Triangle Support Partnership, Cebu City, Philippines. viii + 35 pp. Honda, Kentaro & Nakamura, Yohei & Nakaoka, Masahiro & Uy, Wilfredo & Fortes, Miguel. (2013). Habitat Use by Fishes in Coral Reefs, Seagrass Beds and Mangrove Habitats in the Philippines. PloS one. 8. e65735. 10.1371/journal.pone.0065735. Jaxion-Harm, Jessica & Saunders, James & Speight, Martin. (2012). Distribution of fish in seagrass, mangroves and coral reefs: Life-stage dependent habitat use in Honduras. Revista de biología tropical. 60. 683-98. 10.15517/rbt.v60i2.3984. Yates, K. K., Rogers, C. S., Herlan, J. J., Brooks, G. R., Smiley, N. A., and Larson, R. A.: Diverse coral communities in mangrove habitats suggest a novel refuge from climate change, Biogeosciences, 11, 4321-4337, https://doi.org/10.5194/bg-11-4321-2014, 2014.